This course is the course recordings, you will have access to the recordings for 30 days after the final session; expires on 04/04/2019. This intensive is for anyone interested in working with yoga, refugees, asylum-seekers and under-served groups. Join Emily as she shares her teachings on OURMALA's specialist evidenced based yoga programme, sensitive to trauma, gender, cultural differences and the reality of under-served people. 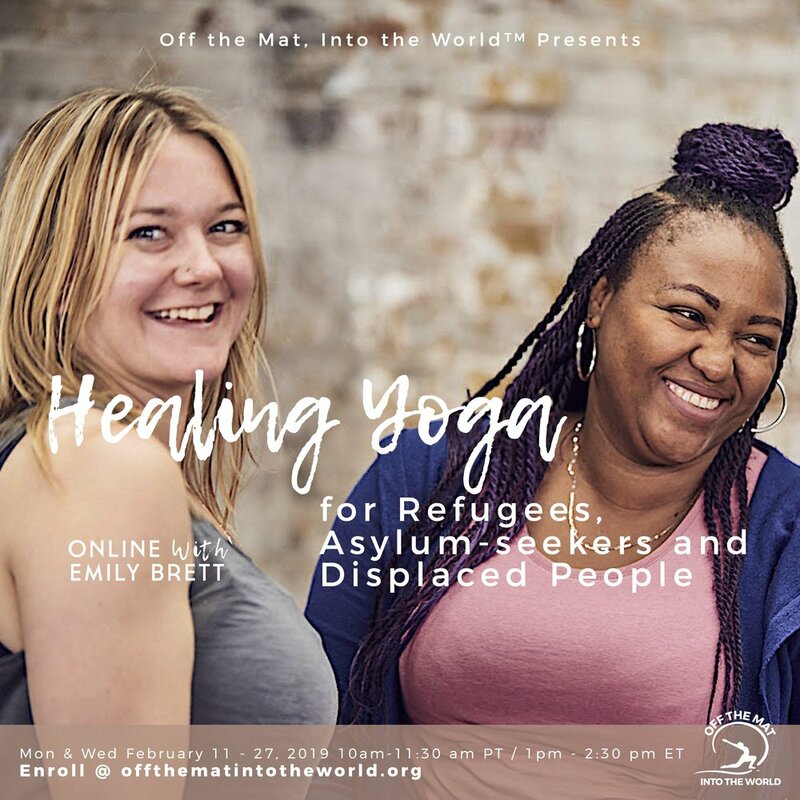 Experience an OURMALA yoga class, hear stories from people who are refugees seeking asylum about how yoga has helped them, understand the science and best practice and learn how to use yoga to serve most effectively, creating a truly healing environment. Welcoming yogis from any background, doctors, psychologists, therapists, programme coordinators – all welcome. This course will give you the fundamentals of OURMALA’s model so you can adopt it or adapt it to run your own yoga programme in the style of OURMALA. Some may like to attend this course because they are simply interested in the work and you are very welcome too. If you are a yoga teacher, you will gain the practical skills and scientific knowledge to teach a class in the style of OURMALA as well as increasing confidence, sensitivity and know-how regarding best practice for making sure your work delivers the most fruitful results. This course will also cover the basics of setting up your own trauma informed yoga programme and running a trauma informed at your own organisation. All profit from this course will enable access to yoga for people who are refugees and seeking asylum through OURMALA's work. OURMALA’s programme is adaptable to other groups such as survivors of gender based violence and disasters. This practical session will introduce you to the key aspects of OURMALA’s programme: What we teach and why, the consistent aspects across all our classes and where there is flexibility. You will be given a hand-out but do bring your notebook and pen too. There will be an element of interactivity and this session is applicable to anyone interested in working sincerely and effectively with yoga and people who are refugees, seeking asylum and under-served groups. Many of the techniques and principles of OURMALA’s programme are transferable and applicable to working with other groups. Some are specialist and designed specifically to meet the needs of the refugee and asylum-seeking community. Live-streamed from London, take part in this yoga class with Emily to give you lived experience of OURMALA’s style. You are welcome – without exception. Please do not worry about your ‘level’ of yoga, or lack of it, or any physical limitation. If you can access this course online, we’d love you to be with us, whether you take part on a yoga mat, chair or other support. Understand the science behind how and why yoga reduces stress, anxiety, depression, loneliness and PTSD symptoms whilst boosting confidence and feelings of welling. Being able to talk about yoga through the lens of science and healthcare is a great asset and potentially very helpful when it comes to winning funding. If you are a healthcare professional, this session will give you the key facts about how yoga works. We will also look at best practice for working with people who are refugees, asylum-seekers and under-served groups. This introduction to the basics will give you practical advice and tips so that you can set-up your own trauma-informed yoga programme or similar. These will include programme structure, boundaries, funding, monitoring and evaluation, governance and social media and the internet. Emily has built OURMALA from the ground-up and now leads a large team, many of whom are volunteers. She will share recommended dos and don’ts as well as insights to hopefully save you time, should you like to set-up a programme yourself. Even if you don’t wish to do this, if you are interested in working with yoga and people who are refugees, asylum-seekers and under-served groups this is still an important session as it will give you a perspective perhaps you haven’t yet considered. Our interactive closing session will present a few different situations that participants will be required to advise how best to manage, based on the course so far. We will then move to to self-care, which is an essential part of OURMALA’s programme, for clients and team members alike. We will finish with Q&A time for questions that have been pre-submitted. This option is the course recordings, you will have access to the recordings for 30 days after the final session; expires on 04/04/2019. *If this is not affordable for you, please email training@offthematintotheworld.org and we’d be happy to talk to you about a lower payment. Choose the sliding scale level and click the PURCHASE RECORDING button. On the pop-up form, enter student’s name and email address, check the media consent agreement, then click the Purchase Recording button at the bottom of the form.